Monday night, St. Gabriel’s Church of God on 37th Street in Milwaukee was filled with about four hundred advocates for justice to both hear Rev. William Barber II speak, and to organize the Poor People’s Campaign in Wisconsin. The crowd was ably led in singing many of the anthems of the 1960’s Civil Rights Movement by a singer who could put Mary Lou Haymer to shame. A small band fronted by an organist enlivened those present in the way the black church does so well. Barber addressed the situation in Charlottesville, Virginia, noting he was present, and even preached in a church there where clergy and parishioners had to be led out by counter protestors into an alley, where they might safely leave the area on that night of the torch parade, that in its own way that Friday was on its scale worthy of Leni Riefenstahl’s propaganda movie making. Barber related how he was twenty feet or so away from the young woman who was killed, along with dozens of others injured, when a car driven by a Neo-Nazi slammed with deliberate intent into a group of counter protestors on that fateful Saturday afternoon. He noted that he was tired, very tired, as he made his way in relays to 25 States and cities to breathe life into this new movement for social and economic justice, to fight poverty and want, to pursue a world and a nation at peace, one not so dominated by a mega military industrial complex supporting an imperial American foreign policy. He pointed to the degradation of the Earth’s environment and climate change as an equally important issue. He went on to declare that he “would rather be tired fighting for justice than rested” and not speaking out in this age of Trump, where so much truth is so badly needed. Barber referenced King’s 1967 Riverside Church speech on 4 April 1967, where King declared himself opposed to the war in Vietnam, and the very sort of imperial adventures we are engaged in today, while defense contractors get money that could be spent to help “the least of these.” A direct connection was made to this unpopular, yet truthful series of declarations by Dr. King, and where that event moved in a direct line to his assassination on the afternoon of 4 April 1968, precisely a year to the day after the Riverside Speech. Then, there is that overriding issue that creeps and slithers its way into the national discourse, an American narrative still dominated by race and white supremacy. People of color, Barber noted, are being taken down by the hate within such a philosophy, labeling them as being somehow lesser beings then their white brothers and sisters. Dr. King wrote in his 1963 Letter from a Birmingham Jail that black people were forever fighting a “sense of nobodyness.” 21st Century America has slipped back on race. We have a “foolish President,” cried Barber, one who is giving aid and support to white supremacists. The Poor People’s Campaign is rooted in a moral approach to these problems, a moral revival of the American spirit. Barber continued that we must declare that denying the poor the right to good public schools is immoral, where racism is immoral, where a nation that permits poverty is immoral, spending for national defense that dwarfs all other nations combined, and takes food out of the mouths of children is immoral. And so the litany of injustice goes. What Barber wants to spark is a movement for justice, initially in 25 States, where just 1,000 people in each of them will be trained to engage in nonviolent direct action, where each will be prepared to engage in what he termed “intense civil disobedience” facing arrest. The aim of such behavior is to change the national narrative away from political party squabbles, celebrities, and a material culture whose greed is itself a challenge to a moral democracy. Already Milwaukee boasts a trained set of activists, who will in turn train the 400 present, and in their turn recruit some 600 or so others, to do the same. Barber quoted scripture where the prophets said that just 10 percent of the people of Israel would challenge the immorality of their day and turn the nation toward God and righteousness. Barber said that for those not rooted in faith, they should look to the Constitution of the United States where it says “we the people” in a preamble that promises a more perfect Union, liberty and justice for all, and promoting the general welfare. He pointed to the Fourteenth Amendment that guarantees the “equal protection of the laws” to all citizens. He made a direct set of references to the movement’s already containing support from the Islamic community of faith in Milwaukee. The President of the Islamic Association of Milwaukee was present, a woman who warmly gave the community’s support to this effort. Indeed, it was a local Jewish Rabbi, a strong and insightful woman, who helped organize the mass meeting in the first place. A local Milwaukee black clergyman met Barber and was inspired to organize it too. Barber also had mentioned how this movement is also pointed toward those in the countryside, where millions of white people share the same economic miseries as do their brothers of color. Liz Theoharis, an ordained member of the clergy like Barber, a Co-Director of the New Poor People’s Campaign, was there too. She spoke movingly about the nation’s troubles, how poverty, and a system that so impoverishes so many children who go to bed hungry at night and takes the food right out of their mouths was immoral. Theoharis, was born and raised in Milwaukee, before joining the Kairos Center in New York which is the umbrella group spawning this movement. Proud parents looked on and their smiles indicated their pride in a daughter so committed to social justice. Barber provided a theme for this early organizing part of the movement where the key word was “breakthrough.” The movement hopes to spawn a revolution in American life where they may break through systemic racism, and injustices that go with greed and the pursuit of money by the 1%. 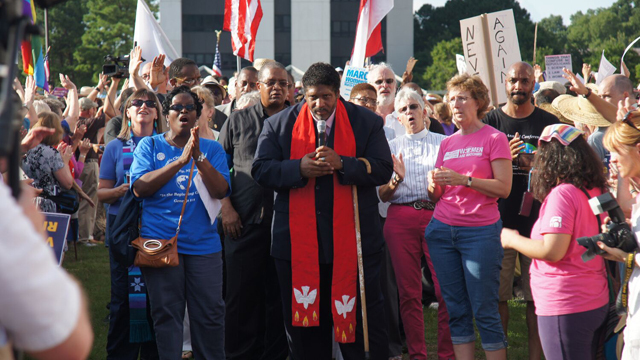 This entry was posted in Community and Citizen Action, It's About Struggles for Justice, National Affairs, Race, The Faith Community and tagged children go hungry, Dr. King, https://poorpeoplescampaign.org/, Justice, Kairos Center, letter from a birmingham jail, Liz Theoharis Co-Director Poor People's Campaign, Milwaukee, Milwaukee Organizing, Milwaukee Poor People's Campaign, Moral Revival, organizing, Poor Peoples Campaign, Poverty, Rev. 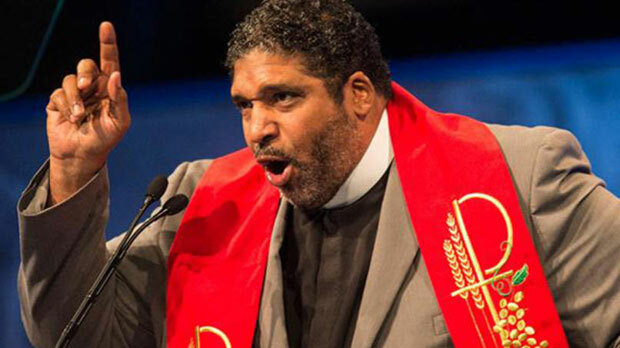 William Barber II, Social Justice, ST. Gabriels Church of God Milwaukee, systemic racism. Bookmark the permalink.